Search Results for "chicago flag"
United States and Chicago Flags Waving on Chicago at Sunset. Flagstaff on the Golden Mile in Chicago city center. American flags waving in the Windy City of Chicago. Flags with the skyscrapers glass windows background. Cinematic Chicago Flag Waving at Sunset. Flagstaff on the Golden Mile in Chicago city center. Chicago flag waving in the Windy City of Chicago. Flag with the skyscrapers glass windows background. United States and Chicago Flags Waving on Michigan Bridge. Flagstaff on the Golden Mile in Chicago city center. American flags waving in the Windy City of Chicago. Close up footage of a Chicago flag in downtown Chicago, Illinois. A 360 around a local Chicago water-tower painted with the Chicago city flag. 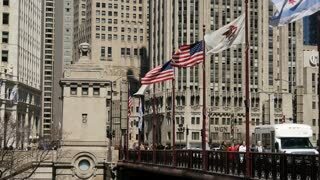 Cinematic footage of the Illinois flag in downtown Chicago. Aerial drone shot of Chicago downtown above the highway with american flag. USA Flag in the middle. Camera tilts up. Aerial drone shot of Chicago downtown above the highway with american flag. USA Flag in the middle.